Each garden within the Chinese New Year display encompasses water, ensuring a positive flow of energy; and the three friends of winter – pine, bamboo and plum, symbolizing perseverance, integrity and modesty, respectively. 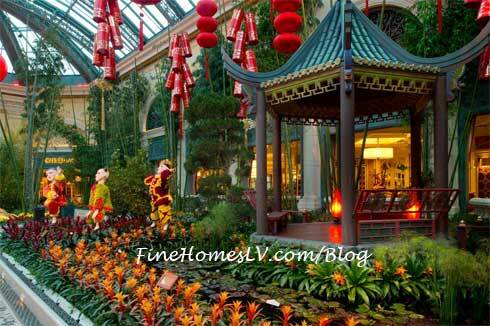 At the entrance of the Conservatory, an 18-foot-tall custom-made Chinese money tree symbolizes prosperity, good fortune and nobility. The bold centerpiece flourishes with 384 oversized gold-leafed coins on its branches as mounds of I-Ching coins, a traditional Chinese symbol for money, surround the base of the lucky tree. At the garden’s edge, two ding pots, ancestral vessels that protect again bad fortune, burn incense from their peaks for good luck. Nearby, a nine-foot-tall friendly King Cobra snake covered in 5,000 blue and yellow luminescent scales is perched atop a mound of gold coins, protecting wealth and good fortune for the upcoming year. Steps away, a waterfall gushes over Taihu rocks believed to encourage circulation of ch’i, or natural energy. Another stunning display within the exhibit is a 35-foot Chinese Junk Boat with a 38-foot mast inspired by traditional 15th century fishing vessels. This 3,000-pound boat created from teak, mahogany and cedar floats in a pond filled with more than 200 Koi fish. 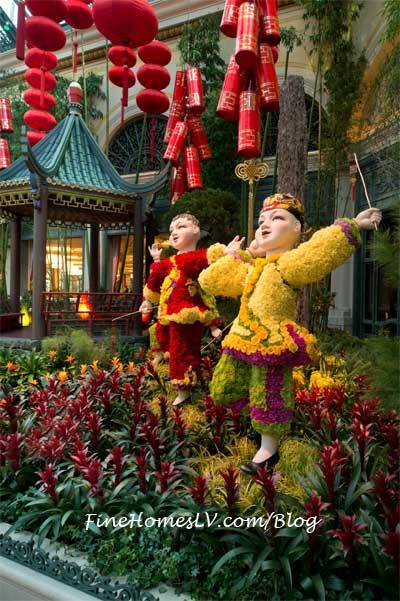 Six “lucky” children, each embellished in 1,800 flowers including carnations, spider mums and Fuji mums, bring life to the display as they play and dance near the Chinese-style pavilion as oversized firecrackers hang above. A zig-zag bridge extends from both sides of the peaceful pavilion, providing a difficult route for negative energy and bad spirits. Enhancing the vibrant Conservatory setting with the sounds of celebration, the Las Vegas-based Beijing Trio performs traditional folk and pop music with authentic Chinese instruments daily from 5 p.m. – 6 p.m.
Legend has it that Buddha asked all the animals to meet him on Chinese New Year. Twelve came. The sixth animal in the Asian zodiac is the cunning snake. 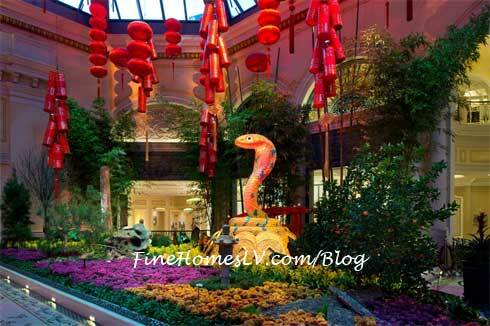 Those born in the Year of the Snake tend to be enigmatic, intuitive, introspective and refined.